Harry V.B. Miller joined the Herzog Law Firm in 1973 as a Summer Associate and was named a Principal in 1979. 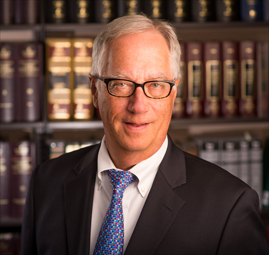 Harry focuses his practice in all areas of Elder Law, including Estate Planning, Medicaid Planning, and Business Succession Planning. Harry’s extensive knowledge of Estate Planning techniques enables him to customize Trusts and other Estate Planning documents to meet the unique needs of all clients. In addition to Estate Planning and Elder Law, Harry has a substantial background in corporate matters, which is invaluable when advising clients on their Business Succession needs. Harry graduated from Albany Law School with a Juris Doctorate in 1974 and from Drew University with a Bachelor of Arts in 1970. Harry is a member of the Trusts & Estates and Elder Law Sections of the New York State Bar Association and the National Academy of Elder Law Attorneys. Harry primarily practices out of the Albany Office. He is a frequent lecturer on Estate and Medicaid Planning. Harry is available for speaking engagements. Please contact our office for more information.